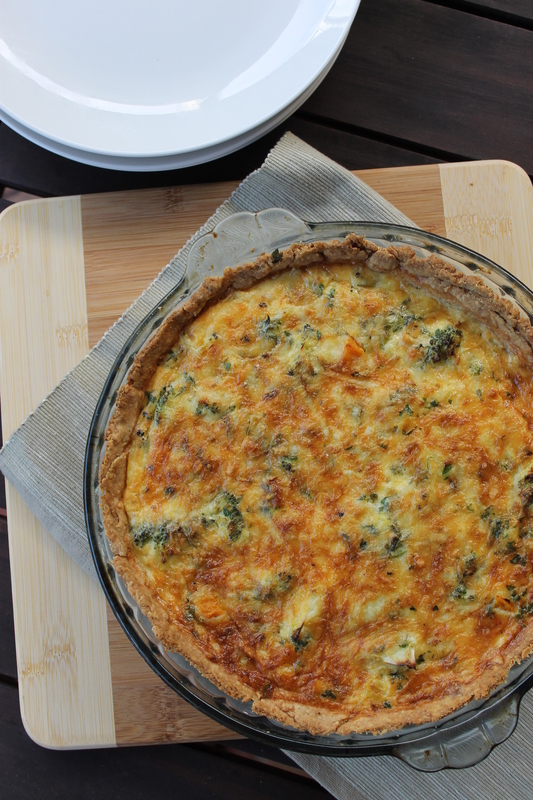 This quiche is a family staple, ‘borrowed’ from Squirrel’s Restaurant in the 1980’s. Hence the odd name. There’s certainly no squirrels in it. As of this year it’s a new improved family staple. You see, sometimes tradition requires alteration. Some tweaking here and there. To produce a real winner of a dish. That’s not to say the essence of the quiche has been modified, oh no. That’s been carefully preserved (I would have faced the wrath of certain family members had it not). With the application of a few key culinary techniques (blind baking, anyone?) this quiche has been transformed from decent nosh to a top notch feed. A smooth, light custard is dotted with florets of nutrient packed broccoli, sweet leeks and butternut squash and topped with golden cheddar. The whole thing is encased in a crisp, crumbly whole-wheat crust. A pastry to knock your socks off. The crowning jewel of the Squirrel’s Quiche 2.0 revamp. You know that gummy stuck-to-the-roof-of-the-mouth sensation that most store bought pastry produces? By making your own you’re almost guaranteed to bypass that scenario. However, failing to chill, rest and blind bake your pastry puts you right back at square one. Quiche with a soggy bottom? Not so appealing. Yeah, blind baking does add another half hour or so to your prep time, but gee-whiz it’s worth it. Whole-wheat flour adds a whole new dimension of flavour, contrasting superbly with the creamy sweet-tinged filling. It also makes the whole pastry ‘situation’ a little healthier. Always a good thing. The recipe’s akin to a puzzle in that each step slots into the next. Therefore whilst the blind baking does require more of your time, it’s minutes you would have spent doing other preparation anyway. No loss there. 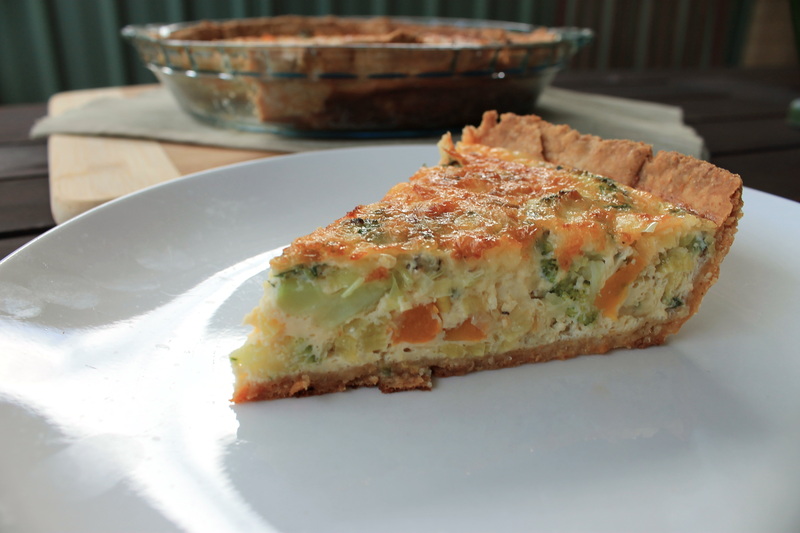 Start chopping up your veg when the pastry lined quiche dish goes into the fridge. Whisk together your eggs and milk and before you know it the chill time’s up. Cook off your veg while the pastry case is blind baking. The veg and pastry case thus cool slightly at the same time. Things in sync? Yep, you did hear it right. Now you’re all set to assemble. A layer of veg goes in the bottom, followed by a sprinkling of herbs for extra yum factor. Expand on that with a good scattering of cheese and finally pour the eggy mix over the top. In the oven we go. Only half an hour or so until the finish line. Hang in there. Once the quiche is gorgeously golden (and set of course) it needs to rest for at least ten minutes. No point cutting it straight away in any case – what good is a burnt tongue going to do you? Eaten hot, cold or at room temperature (the best way by my book), this is a virtually guilt-free quiche worth putting in the extra time for. Pastry: Tip flour, salt and paprika into a bowl. Whisk thoroughly to combine. Use your fingertips to rub the cubes of butter into the flour until the mixture represents fine breadcrumbs. Slowly drizzle in the cold water (you may need a little more or less) and draw the flour into the liquid, until it comes together, forming a rough dough. Knead lightly for a brief period on a floured surface until the dough forms a smooth ball. Cover with cling wrap and refrigerate for at least 30 minutes. Roll the pastry out to approximately 5mm thick. Slide the pastry over your rolling pin and use the pin to help you lower the pastry into a well-greased 9 inch/23 cm quiche dish. Trim the edges so that they are a little higher than the lip of the dish (the pastry will shrink when cooking). Refrigerate for at least 30 minutes. Preheat oven to 200C. Use a fork to poke a few holes in the bottom of the pastry. Place a sheet of baking paper over the pastry and fill with baking beans. Bake for 10 minutes. Remove baking paper and beans and bake for another 5 minutes until light golden brown. Let cool slightly. Filling: Meanwhile, heat butter in a large frying pan. Sweat the leek for 4 minutes or until it begins to soften. Add the pumpkin and broccoli and sauté another 4 minutes. Place a lid on the frying pan and cook a further 3 minutes or until pumpkin is just tender. Remove from heat. In a large bowl whisk together the eggs, milk, salt and pepper. Spread the vegetables out evenly in the bottom of the pastry crust, sprinkle with the chopped herbs and top with grated cheese. Carefully pour over the egg mixture. Bake for approximately 25 minutes or until golden brown on top and set. Set the quiche dish on a wire rack and leave to cool for 10 minutes before cutting. If kept well covered in the refrigerator, will last for approximately 3 days. Source: Adapted from Squirrel’s Restaurant, Brisbane, Australia circa 1983. What a lovely recipe, the quiche looks very delicious.